Col. Kilgore (Apocalypse Now) may love the smell of napalm in the morning but I prefer the smell of bacon. And I don’t mean the smell from a squad room full of cops. I’m talking about the smell of bacon frying in a cast iron skillet. (It’s ok for me to make that joke---I was one.) The pleasure is even greater with the knowledge that you have cured and smoked it yourself and raised the pig that provided it. While most of you reading this are not in a position to raise your own pig, we can help you out with that task, but that’s a discussion for another time. In the meantime, get down to your local butcher and get a nice piece of pork belly and let’s get started. 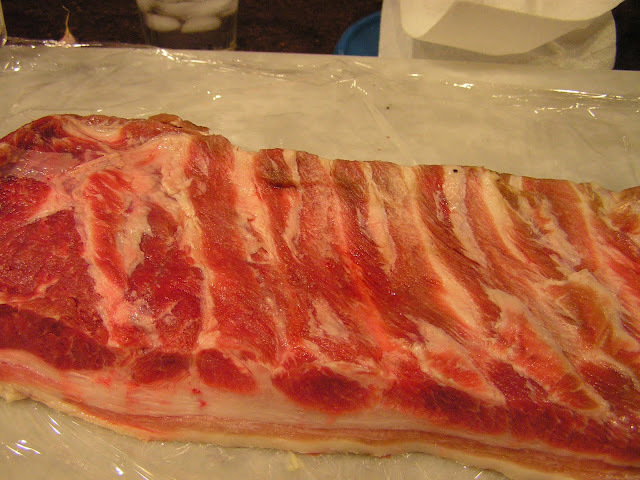 To cure the meat, place the pork belly in a nonreactive storage container and rub thoroughly all over with curing salt. Rub the top surface of the belly with half the pepper, half the bay, half the sugar, and half the salt. Turn the belly over and repeat with the remaining pepper, bay, sugar, and salt. Cover tightly and refrigerate for 2 days. Turn the belly over, cover, and refrigerate for 3 more days. Remove the meat and pat it dry with paper towels. Discard the curing liquid that has formed in the container. At this point, the bacon is ready to use as is or to smoke. When the curing was done, I couldn’t wait to try it so I fried some up and found it just a little too salty for my taste so I submerged it in a container of cold water and refrigerated it overnight. I tried it again the next day and was very pleased with the result. The salt balance was perfect. Then I smoked it for 5 hours using apple wood until the pork belly reached an internal temperature of 150 degrees. The taste and texture was amazing although I think the next time I will probably reduce the smoking time to 3 hours. Don’t hesitate to try this. It really is easy. Once you’ve tried it though, you may never settle for store-bought bacon again. Have you ever done your own meat curing? Would you share your experiences with the rest of us? Since we just got our pig back from the butcher we will be venturing into more charcuterie so look for a posting soon on home cured pancetta.